"If you were completely unsure as to whether it would rain tomorrow, what probability of precipitation should you forecast?" The answers to this question are something to which I've long been interested. I would appreciate it if you would register your answer below. I'll leave the poll up for a few days, after which I'll write a new post with the results and the correct answer. Please share this poll with your friends and colleagues. However, if you do share this poll, please do not "explain" your answer. I would like to try and get people's personal thoughts on this question; not necessarily the correct answer. For this reason, and this reason alone, I have turned off comments for this particular post. Please note that this poll is informal and anonymous. No personal information is being collected! Lastly, when clicking either the "vote" or "view" buttons, you will be taken to the poll hosting company's website. You can use the back button to return to this page. what probability of precipitation should you forecast? 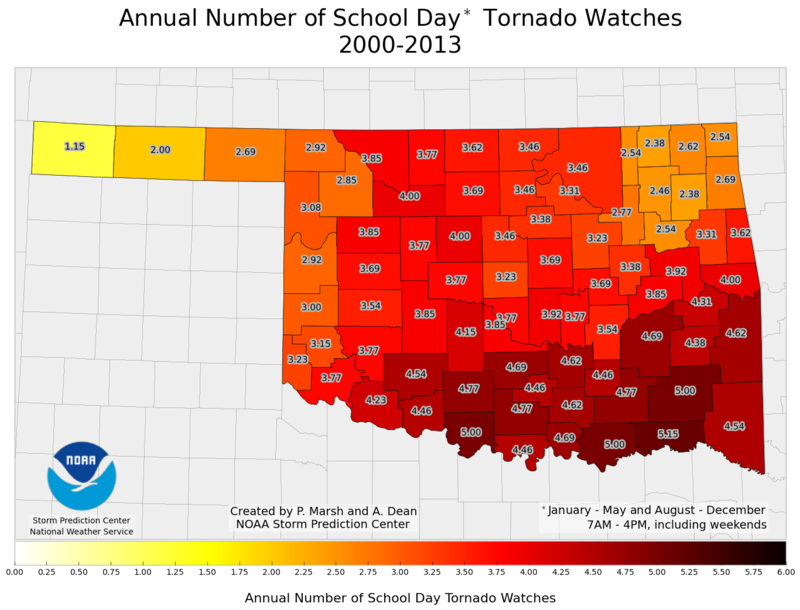 With the school year either already begun, or about to begin, for much of Oklahoma, I thought I'd write a post about the Oklahoma School Year and severe weather. For these results, I've identified the school year as every day between the months of January through (and including) May as well as August through (and including) December. (Note, this means that I am including weekend days in this calculation.) Additionally, I am using the Storm Prediction Center's outlook data from January 2000 through the end of 2012. 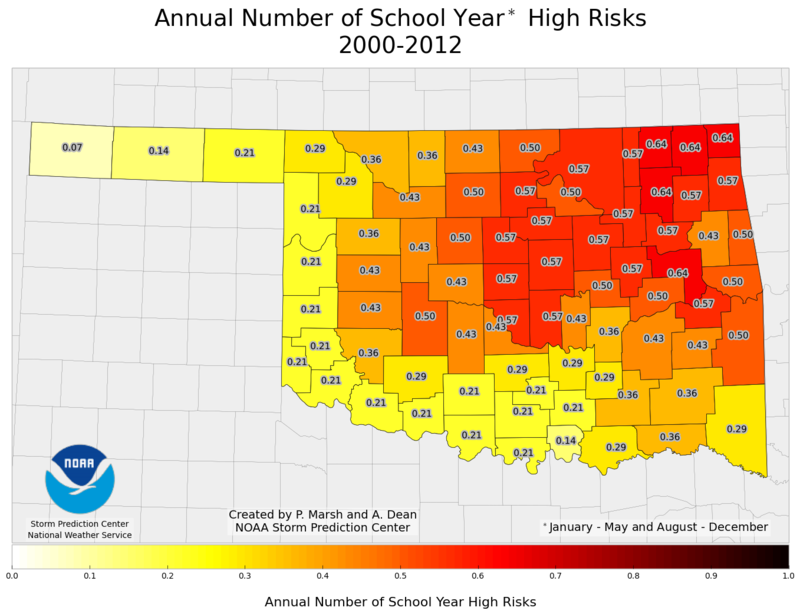 Below is plot of the average annual number of school days (including weekends) in which each Oklahoma county was placed in a Storm Prediction Center Slight Risk (or a higher risk category). As you can see, this ranges anywhere from 17 days in the far western Oklahoma Panhandle to around 37 days in southeastern Oklahoma. 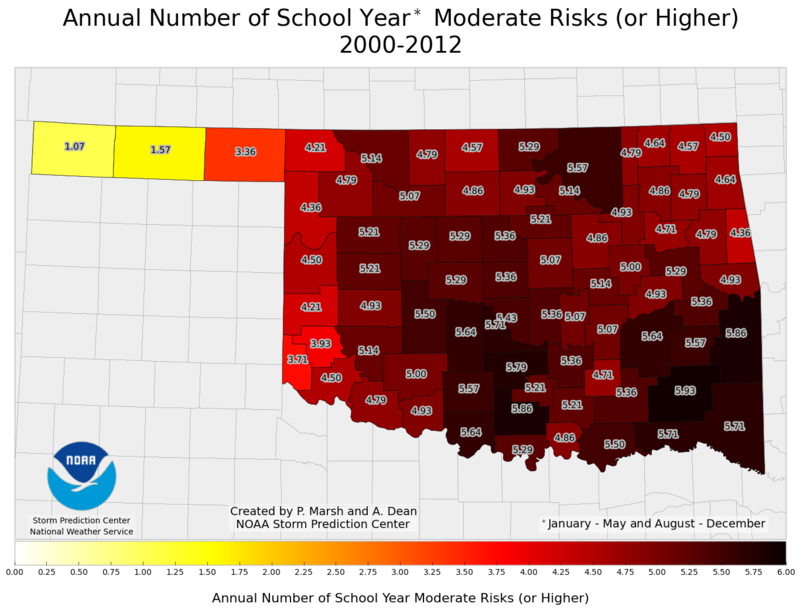 Next is a plot of the average annual number of school days (including weekends) in which each Oklahoma county was placed in a Storm Prediction Center Moderate Risk (or a higher risk category). As you can see, this ranges anywhere from about 1 day in the far western Oklahoma Panhandle to around 6 days in southeastern Oklahoma. 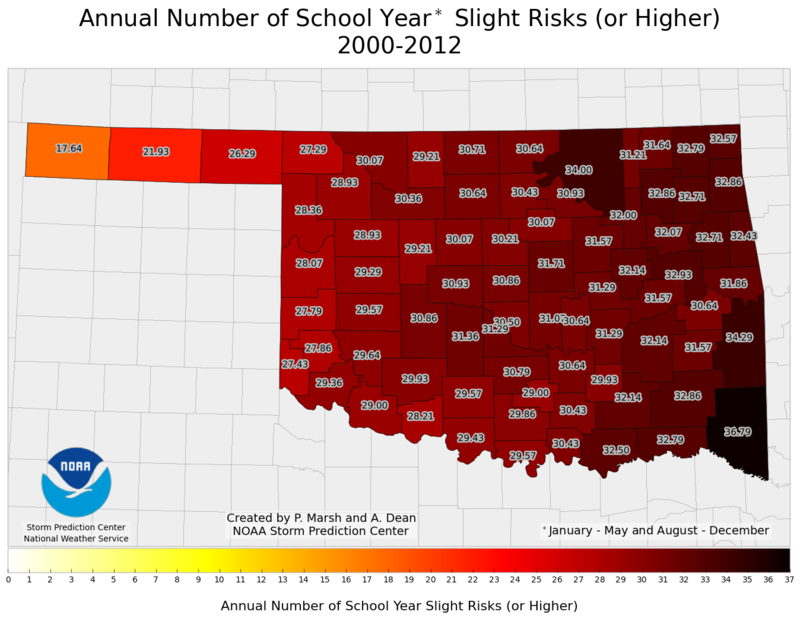 Next is a plot of the average annual number of school days (including weekends) in which each Oklahoma county was placed in a Storm Prediction Center High Risk. As you can see, this ranges anywhere from almost never in the far western Oklahoma Panhandle to around once every 2 years in northeastern Oklahoma. 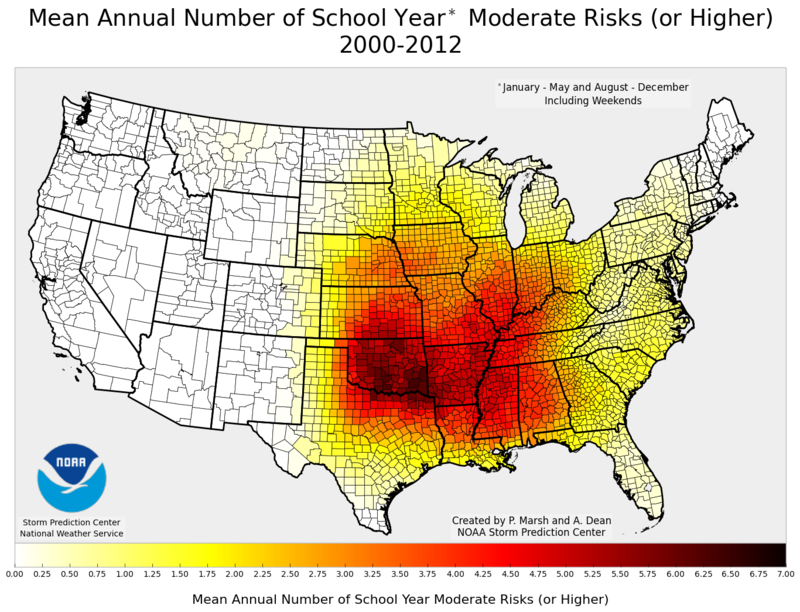 Most of the spatial pattern comes from the annual cycle of the climatological probabilities of severe weather occurrence. What I mean by this is that during the "cool season" (late fall through early spring), the higher climatological probabilities of severe weather occurrence are in the southeastern United States. As spring begins, the climatological peak values begin to expand and increase into the southern plains. 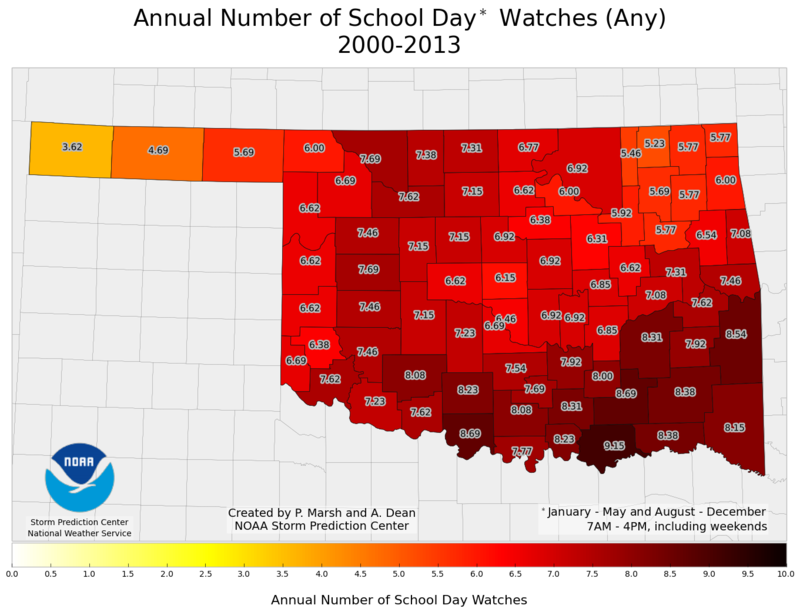 This means that southeast Oklahoma spends more time in the climatological peak during its school year, because the rest of Oklahoma spends time in its climatological peak when the school year has ended. This is especially true with the Oklahoma Panhandle, which doesn't see it's climatological peaks until very late May into late June. 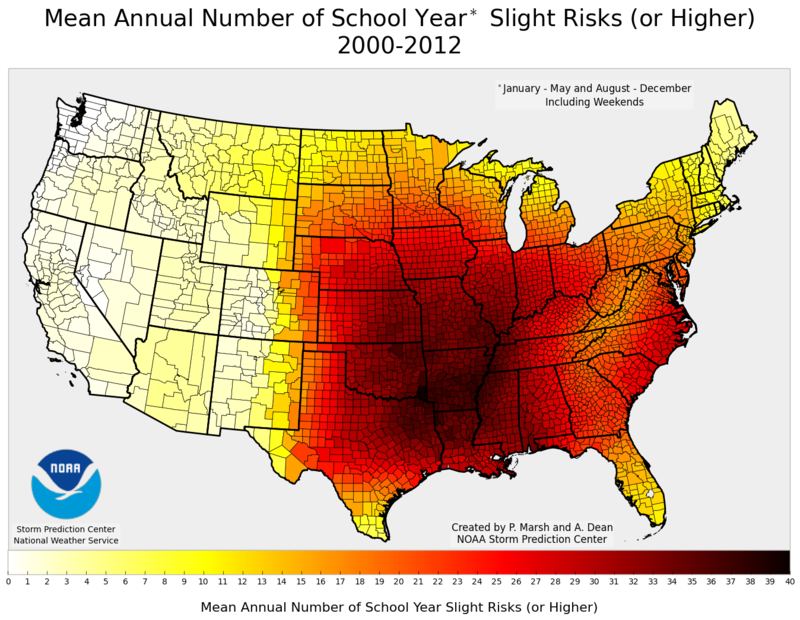 Of note is that it is actually northeast Oklahoma that has a higher likelihood of experiencing a High Risk during the school year than anywhere else in the state. Based on my previous explanation, one might have thought that southeast Oklahoma would be the expectant maximum of High Risks. My guess is that this is due to the fact that High Risks are rare, and require a rare combination of ingredients coming together, as is evident by the relatively few times they are issued. One of these ingredients is an extremely strong, dynamical storm. When this is the case, for reasons I won't get into here (partly because I don't think meteorologists are completely sure), these storm systems tend to track a little bit farther north. 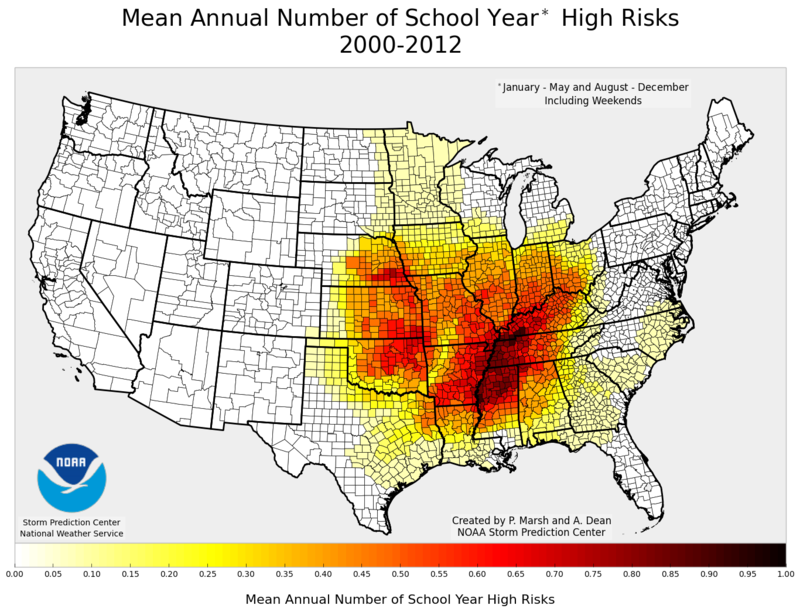 This results in northern preference for high risks. Additionally, a lot of moisture is needed to help produce large amounts of instability. Given that the Gulf of Mexico is slightly east of our longitude, it's easier for moisture to return to eastern Oklahoma than western Oklahoma. Below is a plot of the average annual number of SPC Severe Thunderstorm Watches issued between 7AM and 4PM during the school year (weekends included). As you can see, this ranges from around 2.5 in the far western Oklahoma Panhandle to slightly more than 4 in southeast Oklahoma. 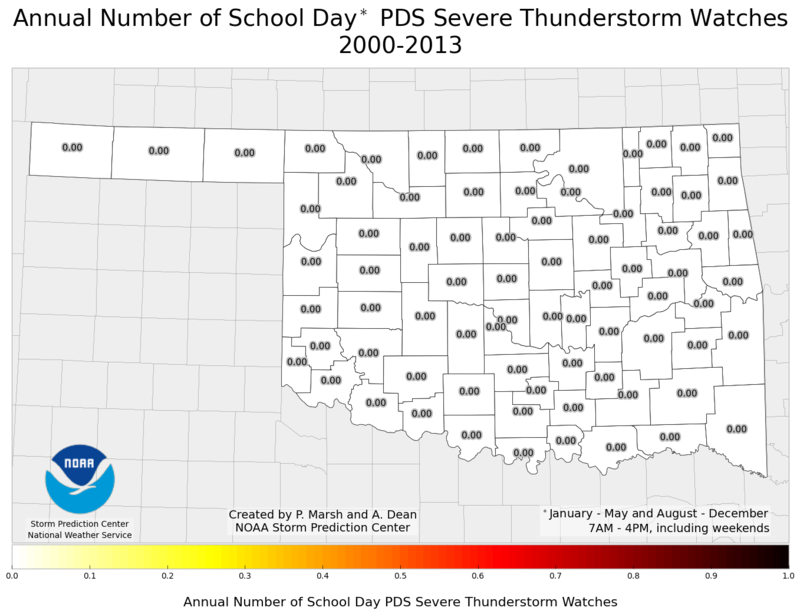 Below is a plot of the average annual number of SPC Particularly Dangerous Situation (PDS) Severe Thunderstorm Watches issued between 7AM and 4PM during the school year (weekends included). As you can see, this has not happened since 2000. Below is a plot of the average annual number of SPC Tornado Watches issued between 7AM and 4PM during the school year (weekends included). As you can see, this ranges from around 1 in the far western Oklahoma Panhandle to slightly more than 5 in southeast Oklahoma. 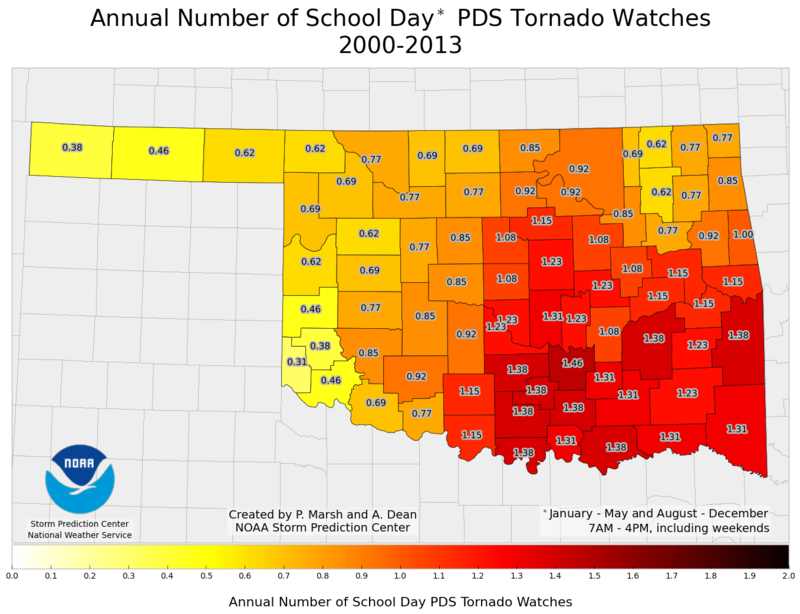 Below is a plot of the average annual number of SPC Particularly Dangerous Situation (PDS) Tornado Watches issued between 7AM and 4PM during the school year (weekends included). As you can see, this ranges from around 0.3 (or once every three years) in the far western Oklahoma Panhandle to around 1.3 in southeast Oklahoma. Taking a look in aggregate, below is a plot of the average annual number of SPC Watches of any kind issued between 7AM and 4PM during the school year (weekends included). As you can see, this ranges from around 3.5 in the far western Oklahoma Panhandle to slightly more than 9 in southeast Oklahoma. 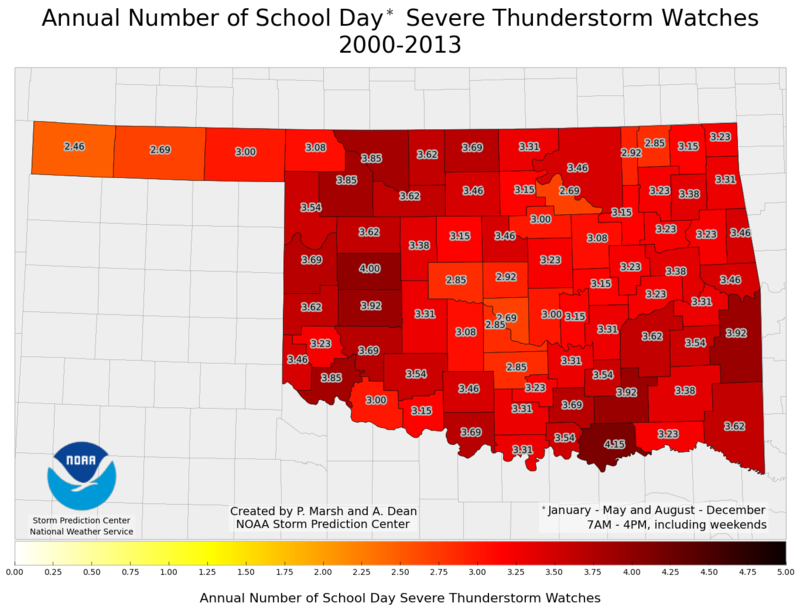 Thus, even though the a large part of the state experiences on average around 30-40 days of severe weather during the school year, less than 10 of those events (on average) occur during the school day itself. With that said, it only takes one event to completely ruin a school year...and a community. The 20 May 2013 Moore, OK tornado is a pointed reminder of this fact. Author Update: AMS has now added an editor's note/disclaimer on the blog post. Earlier today on the American Meteorological Society (AMS; of which I am a member) blog, a post was published that advocated for the privitization of weather forecasts. In a nutshell, the blog post suggested that the US government, and more specifically the National Weather Service, is inefficient in its generation of forecasts and therefore should stick to the mission of generating and providing raw data and discontinue the creation of weather forecasts. 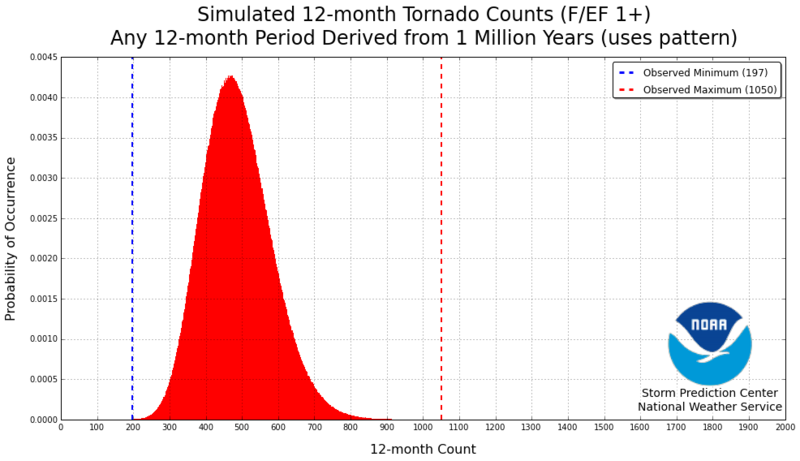 The blog post goes on to state that the US government could/should purchase forecasts from private companies for citizens that cannot afford to purchase their own forecasts. Although as an American citizen I find this arrangement unacceptable, and yet another attempt at privitizing profits (removing the government forecasts) and socializing losses (the generation/collection of the data), I will leave that discussion for another time and place. My real issue is not so much the fact that a private weather company is advocating for this arrangement, it is that the AMS allowed such a post to be featured on their blog without opposing viewpoints. Whether or not the AMS agrees, their blog is a reflection of the AMS and its positions. By allowing such a post to be published publicly, without differing views, the AMS is implicitly endorsing this position. The AMS has implicitly chosen a side --- especially when no disclaimer saying otherwise can be found on the website! (I understand that the particular position being advocated in this blog post is not the official position of the AMS. However, the simple fact is that an overwhelming majority of people will not take the time to delve into the nitty-gritty details and jargon of AMS position statements.) Why on earth would the AMS think that featuring/allowing a blog post, on the organization's website, that attacks a portion of the AMS's constituency, without allowing that constituency's view to be shared, would be a good idea? If the AMS membership wants to have this discussion, I'm all for it. Positions and views should always be debated and discussed openly and freely. However, we should have this dicussion amongst the membership, and then share the discussion/consensus, rather than have the opening salvo feature one side of the discussion. The fact that this post is featured on the website the week before the AMS Community Meeting is to be held leads credence to this appearing as an official AMS position.